Goal-poacher supreme Josh Wilson salvaged a draw for Chorley in added time. But with Stockport winning their title-chasers’ ‘six-pointer’ against Spennymoor, the Magpies’ lead at the top of National League North was trimmed to just one point. 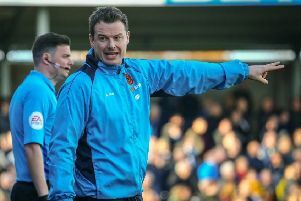 It took Jamie Vermiglio’s side a long time to stamp any authority on this game and it was only in the last half-hour that Darlington’s new loan signing, Bolton Wanderers keeper Jake Turner, was forced into serious action. In contrast, Matt Urwin several times kept Chorley in it with top-class saves. After early half-chances for both teams, Urwin pulled off a great double save to keep Darlington at bay,before Elliot Newby set up Marcus Carver, the striker shooting disappointingly wide. The Magpies were caught on the break for the opening goal in the 43rd minute. Wilson Kneeshaw burst through the middle and exchanged passes with Steve Thompson before coolly firing past Urwin. It was a more determined Chorley who began the second half, the Newby brothers combining well only for Elliot Newby to direct his volley just too high. But Darlington remained dangerous and following a tremendous run by Harvey Saunders, Urwin again saved the day. At the other end, Turner produced a superb low one-handed save from Courtney Meppen-Walter’s header from a corner. The Magpies, now at last imposing themselves on the game, were guilty of failing to hit the target from three decent scoring chances, Elliot Newby – twice – and Carver firing over the bar. Darlington came very close to settling the contest with three minutes to go. Another brilliant run by the tricky Saunders culminated in a stinging drive bound for the top corner which Urwin athletically tipped over the bar. 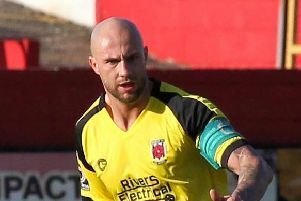 The save proved crucial as Chorley equalised in the third minute of added time. Matt Challoner got in a wonderful centre which Wilson, ghosting in, met with a smart diving header at the far post. Quakers’ manager Tommy Wright felt his side should have won the game but readily acknowledged Chorley’s strengths. Vermiglio was pleased with a point. The Magpies boss said: “Given where we were at half-time, we’re happy with a draw. CHORLEY : Urwin, Challoner, Blakeman, Teague, Meppen-Walter, Jordan (Hooper 82), A Newby, O’Keefe (McGurk 66), Carver, Almond (Wilson 66), E Newby. Subs (not used): Cottrell, Anson.